Kerrygold, Ireland’s leading butter brand, is facing a potential law suit over it’s ‘grass-fed’ claims. Californian Dyami Myers-Taylor has lodged an action claiming that Kerrygold makes false and misleading claims about its butter. He says, in papers filed, that he is bringing the action on behalf of himself and all similarly situated persons who were misled into purchasing Kerrygold Products due to false and misleading advertising. Myers-Taylor states that he would not have purchased or paid a price premium for the Kerrygold Products had he known that the representations, “Milk From Grass-fed Cows”, “Made with milk from grass-fed cows not treated with rBST or other growth hormones”, “All Natural”, and “100% Pure and Natural” were false, deceptive and/or misleading. He claims that he saw and read the Grass-Fed Claims on product packaging and relied on the representations, statements, and warranties thereon and on the Kerrygold website in believing that the Kerrygold Products were made with milk from grass-fed cows and purchased the Kerrygold Products based on the perception of value derived from those representations. He says that Kerrygold Products are derived from cows that are fed soy, corn and other grains, among other non-grass feed, including grains that are genetically modified, and are thus not “grass-fed” as advertised. His claim goes on to state that the false nature of the grass-fed claims on the Kerrygold Products is compounded by the fact that there are other, better alternatives to genetically modified and other grains that Kerrygold could feed its cows to increase the quality of the Kerrygold Products, including 100pc hay, which some of Kerrygold’s competitors in fact do. Grass-fed butter has become hugely popular in recent years as part of a low carb, high fat diet. Kerrygold is the number one imported butter and the number three overall butter brand in the US. A law from 1970 in the state means that all butter which is intended for commercial use must be put before a panel of experts and issued a letter grade for quality. 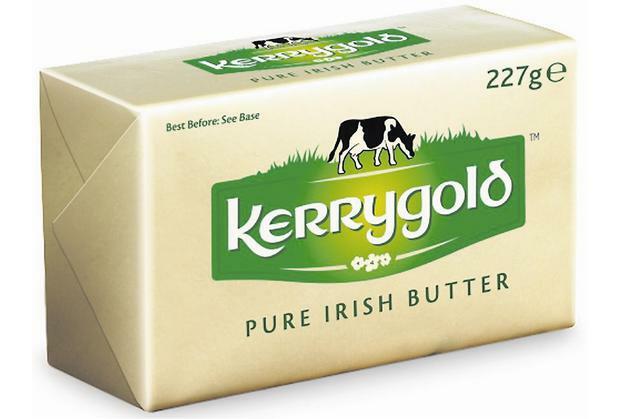 Kerrygold also faced legal issues in the US last year when it was involved in a legal action against a local company who had commenced selling butter under the Irishgold brand, which Ornua claim has infringed their trademark.